A vitamin-boosted electrolyte water with 100% of the daily value of vitamins B, C and E, delicious flavors, and no artificial sweeteners. Introducing Propel Vitamin Boost Strawberry Raspberry. A vitamin-boosted electrolyte water with 100% of the daily value of vitamins B, C and E, delicious flavors, and no artificial sweeteners. Try Propel Vitamin Boost Peach Mango. Propel is the only water among national enhanced water brands with enough electrolytes to put back what you lose in sweat. 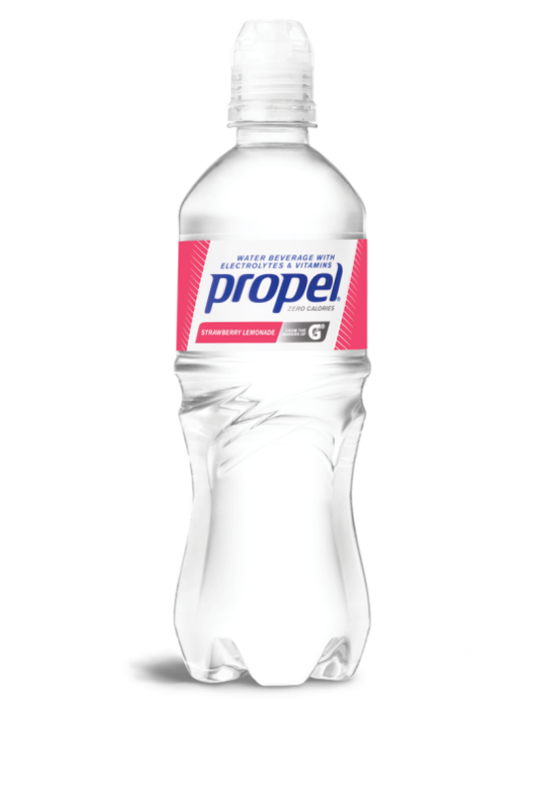 Propel Electrolyte Water contains zero calories and vitamins B, C & E.
Propel replenishes you with antioxidant vitamins while quenching your thirst with a blast of kiwi strawberry flavor and zero calories. Propel Watermelon, a refreshing, zero calorie water containing the same level of electrolytes as Gatorade and vitamins. Propel replenishes you with antioxidant vitamins while quenching your thirst with a gush of grape flavor – without adding calories. Give your body what it needs for its active life. Propel replenishes you with antioxidant vitamins while quenching your thirst with a burst of berry flavor and zero calories.